James Madison was the 4th President of the United States. He has been called "The Father of the Constitution" for being instrumental in the drafting of the United States Constitution. He also drafted the first 10 amendments to the Constitution and is subsequently called "The Father of the Bill of Rights." 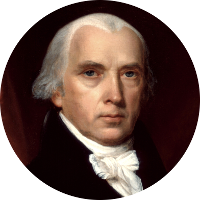 James Madison was born on 16 March 1751 (05 March 1750/1 O.S.) in Port Conway, Virginia to James and Nelly (Conway) Madison. He is said to have been a sickly child who spent most of his time reading books. As an adult he never weighed more than 100 pounds, and at 5‘4" tall he hold‘s the distinction of being the shortest U.S. President ever. During his presidency, James Madison lead the United States to war with Great Britain which became known as the War of 1812. In 1814 British troops burned Washington D.C., and with it the White House which was then known as the Presidential Mansion or Executive Mansion. A myth evolved that President Madison ordered the mansion whitewashed as part of the repairs to restore it. As a result, the mansion was thereafter known as the White House. However, the first use of the term White House by the public in reference to the Executive Mansion was said to have occurred in 1811 before the war even began. As for officially being known as the White House, this didn't occur until 1901 when President Theodore Roosevelt had his stationary engraved with the term. President Madison's family tree contains some interesting close relations. He was a 2nd cousin to President Zachary Taylor and a 3rd cousin to Meriwether Lewis of the Lewis & Clark expedition. In addition he was a 4th cousin 5 times and 6 times removed to President Teddy Roosevelt, First Lady Eleanor Roosevelt, and the infamous Lee Harvey Oswald. He also has family ties to President Barack Obama, Walt Disney, the infamous Lizzie Borden, and to Royalty as a descendant of both Alfred the Great and Charlemagne.